10 b/w photos 75 maps 5 x 7 Complete descriptions of 170 great day hikes on the AT Easy-to-read topographic maps and elevation profiles for each hike Plants, wildlife, and historical points to see along the way From the spruce forests of Tennessee and the leafy gorges of Virginia to the rolling Pennsylvania hills and the rocky heights of New England, the Appalachian Trail offers 2,200 miles of hiking opportunities. The five books in this series present accurate, detailed information for 170 day hikes (and a few overnighters), all recommended by AT experts. Where to start and finish, water sources and shelters, early exit options, and what to expect on the trail itself are described. Specially commissioned easy-to-read-and-use topographic maps and elevation profiles accompany each recommended hike; mileage data, the best direction to travel, route difficulty, and sources for additional maps and information are also included. Each book points out natural and historical featuresplants, trees, animals, landforms, bridges, vistasthat make the recommended hikes special. 37 hikes in New Hampshire and Maine. Maine’s dramatic coast and accessible southern mountains are some of the prime hiking destinations in the Northeast. John Gibson, the author of numerous books and articles on Maine’s coast and mountains, describes the best hikes in the Western Mountains, the Oxford Hills, Evans Notch Range, the Mahoosuc Range, the Camden Hills, Monhegan Island, and Acadia National Park on Mount Desert Island. Outings range from short walks for families to all-day climbs for serious hikers. There is a rich selection of hikes in each of southern Maine’s major recreation areas, and many hikes are within easy reach of Maine’s major population centers. Each hike description includes a topographic map, information on difficulty, mileage, and rise, and a detailed description of the route. Both locals and travelers will find miles of satisfying hiking here. Features two new hikes on Ragged and Bald Mountains. 60 black & white photographs, 51 maps, index. 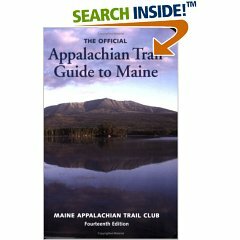 Official guidebook and maps to the Appalachian Trail in Maine-covering 281 miles from Mt. Katahdin in Baxter State Park to the New Hampshire line, packaged with 7 four-color topographical maps, with elevation profiles and trail descriptions. Published by the Maine Appalachian Trail Club.